Jo van Kan has a wealth of knowledge and experience from working in the Industry for over 14 years selling in a variety of cycles in the market. Jo’s success is a result of her passion for people and property. She is a quick, creative thinker, and has always given her clients the edge over the competition by backing innovative marketing with excellent sales and negotiating performance. Building easy rapport, excellent listening skills and providing her vendors, buyers and colleagues with the best service possible. Jo holds a Branch Managers License and has partly completed the Graduate Diploma in Business (Real Estate) from Massey University. These qualifications along with her experience in real estate, allows Jo to ensure her colleagues at Harcourts Blue Fern follow best practice Real Estate Agents Authority (REAA) requirements around licensing and codes of conduct. Jo is thrilled to be supporting every level of the market leader in New Zealand real estate – Harcourts Blue Fern to enable them to meet their goals while offering clients unparalleled customer service and results. Jade Min is highly motivated and passionate about real estate. She listens to her customer's needs, offering effective help and solutions. She has a great network of buyers and sellers that she connects with regularly. Jade min is honest, reliable and professional. 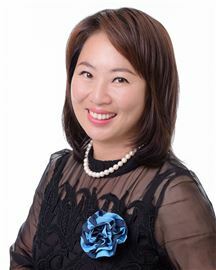 Valuing education, she graduated from the famous Wuhan University in China and holds a Masters degree in Art Management from Auckland University of Technology, also a Postgraduate degree in Television from Auckland University and Graduate Diploma in Media Studies from Waikato University. Jade Min is a very successful curator and has been involved in big events for the Chinese and New Zealand Government and has been invited to represent different New Zealand Communities. During this time, Jade built a large database of buyers. Jade Min is a very experienced Sales person, having worked in the Jewellery Industry with Diamond and Gem stones and achieving many awards, and testimonials from her customers. “I am here to use my professional services to listen your needs and help you to achieve your goals." Awards: •	Number 8 in Top 10 Harcourts Blue Fern Realty Group October 2017 Awards. •	Harcourts Blue Fern Realty October Rising Star. If anyone can Mark can! When family man Mark van Kan decided to move to west Auckland, he needed answers from someone with knowledge about how to, where to, how much and so on….Having been a proud Westie' now for more than 13 years, Mark can now answer them for you! He has successfully bought, sold and renovated homes along the way, his life experiences have grown with his knowledge base. Mark's previous business skills, gleaned from years of operating his own graphic design business, enable him to bring a creative, yet strategic approach, to your buying or selling experience. With good old fashioned work ethic, strong negotiation skills – also learned from raising four children, Mark believes this business is just about listening, then connecting the right people to the right property at the right price! Need someone to help you facilitate your next move or secure that investment property you have been saving for? Then call Mark van Kan today and start your real estate journey with him. Heather has been involved in the Real Estate Industry for over 12 years, enjoying a number of roles including, Selling PA, Sales & Marketing Administrator, Property Manager and now Office Administrator. Heather started with Harcourts and after 12 years is happy to be back with New Zealand's most trusted Real Estate brand. First time in 42 years!